Alien Pastures » Why the relative silence? I realize that I have been kind of silent on the blog these past weeks. There are several reasons for that. Primary reason was that I was training helpdesk teams in Asia – and no, unfortunately I did not get to travel there despite original suggestions… higher authorities deemed it better (read: cheaper) to use Microsoft Lync for the training sessions. Two weeks of looking at my computer screen while talking to electrons… that was pretty exhausting. Also, I have been working on the next Plasma 5 batch aka my ‘ktown-testing‘ package set. Almost finished compiling, I will be waiting with my upload until the sources for Frameworks are officially released – should be tomorrow. And finally, two years after speaking about it for the first time, I finally sat down and started working in earnest on my new “Project X”. Errr? Riding the top of my TODO list for a long time, I have been meaning to create a Live version of Slackware. I know, there’s Porteus of course (they have an impressive ISO generator wizard by the way), and SLAX. Both are great Live distros based on Slackware. And there is SlackEX and Salix Live, and possibly some others too. Then why the urge to create yet another Live version of Slackware? Simply: because those others are Slackware-derived, and they have carved a niche of their own, but none of them are really Slackware. Also, I have been irritated by past distro reviews where the reviewer complained that Slackware did not have a Live version. Meaning, to give it a test run they would have to install the distro to an actual computer – which would lead to the usual moaning about the arcane installer and “Slackware not keeping up with time”. Target should be slackware-current – the bleeding edge. Many people want to know what that looks like but are hesitant to install slackware-current for fear that it breaks stuff and causes productivity loss. Foremost, this was meant to be a learning experience. I had no idea how a Live CD/DVD worked. I knew it had to be different from how a regular installation to a USB stick would work. Booting from a CD or DVD implicates that whenever the OS wants to write to disk, some measures have to be taken so that write operations would still be possible. Writing to a read-only CD medium is impossible so writes have to be done to RAM somehow. Still learning! Without doubt, the work done by Porteus, Slackware-Live scripts, Salix and Slackel was an inspiration during my journey to discover how this stuff works, but I did not have a need for all their complexity. I tried to keep my scripts simple and barebones and stick to the goals of creating an education and demonstration tool. I am using syslinux and its sibling extlinux for booting up the Live environment… not lilo or grub or elilo. Why? Because I wanted to know more about Syslinux’ capabilities. I created a 700 MB ISO (fits on a CDROM!) containing a stripped-down Slackware with XFCE as the Desktop Environment and XDM as the graphical login manager. I also “prettified” XDM as you can see below. XDM now has proper “halt” and “reboot” buttons and Slackware logo. 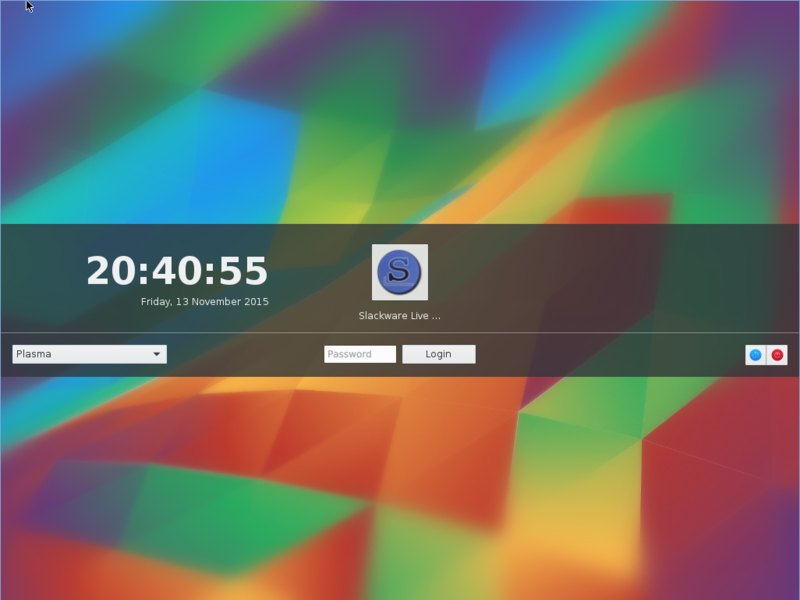 The version of Plasma 5 shown in the screenshots is my still unreleased ktown package set by the way – showing that this Slackware Live would be a powerful way of showing what Slackware is capable of. Note: my live scripts are using features only available in 4.0 kernels and higher. This makes my live environment unfit for any released version of Slackware. That is not bad. In fact, if you are looking for production-ready live OSes you are probably better of by using any of the previously mentioned distros. My version of Slackware Live is a real demo tool for the development tree of Slackware. Its core is a single script “make_slackware_live.sh” and a set of configuration files. Plus a “live init” script which replaces Slackware’s init script in the initrd image which is created by “mkinitrd”. Essentially it will be so basic that everyone should understand how this works in no time at all. After all these big words, is there more to show than just screenshot teasers? Well, no. I am nagging the coreteam to give the ISOs a test run and this has already exposed some bugs that I am working on eradicating. When I feel confident enough I will probably upload the XFCE and Plasma 5 versions, and when the feedback is OK (and I fixed all the glaring bugs you guys will surely uncover) I will also release the scripts. For now… it’s just the screenshots. What do you think, is this worth while? Or do you think it is redundant? A most definitely worthwhile project. This is a great idea! I have a USB key with a bunch of live distros on it (including Slax, SlackEx) I use on a regular basis for troubleshooting, but each one is missing at least one tool (a utility, command, or sometimes just 32-bit compatibility) I’d *love* a full-on Slackware live image! Oooh! Looking forward to trying out the Plasma5 version when it’s ready. I dreamt of it ! This is massive, Eric! Very very good! I’m getting a bit tired of the blank looks when I tell people I run Slackware Linux throughout the house. Ubuntu, etc, they heard of, but Slack-what? A live version would make it much easier “to whip it out” for a demo. Thanks, this is a great idea. Looking forward to sharing it. That would be cool Eric. I think this is an excellent idea. I have a 32-bit Slax USB stick that I’m regularly using either for hardware diagnostics or data recovery. I’ll gladly switch to a “real” Slackware Live system. I particularly like the part about the custom xdm because I believe Slackware should do more about ‘blowing its trumpet’. And little things like custom logins, or boot screrens in colour with the logo, can go a long way. And overall, the idea of a live demo is good. As a contributor to PartedMagic, a live distro belonging to the Slackware family, I keep an eye on amongst other things how our “brothers” implement the live feature. So I am eagerly awaiting “Project X”s outcome. And of course I offer my help, might you ever need it. It would be certainly very interesting, for example to test a new Desktop Environment like Plasma 5 without having to do anything, because it is not an easy task to uninstall the old one, install the new one, and possibly re-install the old one if we don’t like the new one. This sounds like a great idea. I would be happy to have a complete Slackware Live system on the USB-/SDCard memory. It would be also nice to have an option for Live Slackware on the UEFI compatible USB. I’d appreciate if I could test Slackware current using a live CD/USB to see what’s coming. Thank you for the effort, Eric. Wonderful idea Eric. I will be very pleased to carry a REAL-Slackware live-system with me, especially for data recovery. On my laptop (HP Zbook) there is an option in the bios to disable “Hybrid graphics”. In this case only the Nvidia card works. Totally worth it! Everyone like me, who uses Slax for recovery or troubleshooting will be able to switch to a full slackware. Thanks a lot Eric. Brilliant. Keep in mind that SLAX and Porteus are highly optimized versions – thei boot time is quite a bit leaner than Slackware and probably the kernel is stripped too. You’ll get the chance to try my version of a Live system soon enough, and then I would love to hear feedback about speed versus functionality. Absolutely wonderful! I think that this will be a great thing for Slackware. Giving the oldest distro some new legs will hopefully show it in new lights. As someone who has modified Porteus for specific hardware I am very interested in watching how this project goes. I carry three usb sticks for function. On release I will have 4. Thank you so much for this!! Absolutely worth the time and effort! Keep up the great work. Please add the Russian language in the installer . Thank you for your work . 3DPACTE – Russian is already in the language selection menu, it just fell off the visible list. Note that this is NOT AN INSTALLER that I am working on. You will not be given a chance to install the Live OS to a harddisk. Great work! Can’t wait to work with USB version! 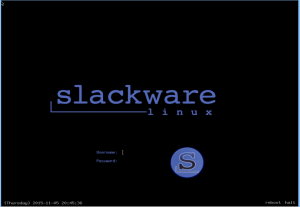 (I used SlaX for that) – but Slackware-current would be better (with some kind of update posibility without need of recreating it on USB stick from the scratch. On a side note, the entry for french should read “français” and not “francois”. Eric, fantastic idea. I had also thought quite often if Slackware had a live version, many more might see the quality & make the move to the ranks. Can’t wait to try this, especially the Plasma 5 version! Wow! The screenshots look amazing! Thanks for all your hard work Eric! This is a great idea and I hope you can release this amazing work for us soon! I still have friends that didn`t know that Slackware had a graphical environment, can you believe that? So this would help them to give it a try without the need of having it installed in their hard drives, bringing more users to our beloved GNU/Linux distribution. Thank you one more time! Great to hear the slackware team is looking into this. I was a slax user that grew tired of waiting for updates, and have been building a live slackware current via stripped tagfiles for ~4 years using Linux live scripts. In particular, my goal has been to minimize steps from slackware current to live ISO. Any thoughts on aufs or the newly kernel friendly overlayfs? I’d be happy to share my experiences and build scripts. Lachman, I am not using aufs. I have waited until overlayfs could do what I needed: multiple stacked read-only “lowerdirs”. I use squashfs modules, loop-mounted, as lowerdirs in an overlay mount. Thanks for the quick response Eric. FYI, I have one script that takes fresh slackware install, rebuilds kernel, and makes it ready for Linux live scripts. If you start with stripped broken tagfiles, generated using ur tagfile script on salix or Porteus for example, u can use slackyd to fill in the dependencies, taking out unnecessary dependencies. Lachman, then I would jut be repeating Porteus. And in that case, using Porteus would be better. My goals are different. I want a Live ISO of a full unmodified Slackware-current. It should be usable as a demo of Slackware to people that do not know what Slackware is, or for people who do not want to *install* -current but want to see how it looks. All man pages should be present. Stripping binaries (I assume you meant ‘removing’ selected binaries) is a level of customization that I do not want to do. — the ability to reliably show the updates in the current session (the aufs-shwh config option). Just to be clear, in this post are old versions of the two simple scripts that can be used to take full slackware current to a live system using Linux live scripts. The first sets up kernel and aufs to get slackware current live scripts friendly. This is all u need to make a full slackware current live as u describe. (probably a few GB). The second script strips unneeded symbols and man pages shrinks that considerably. Again, happy to share latest version. Use these ideas all the time. Panagiotis, I mentioned the Slackware-Live scripts in my article. Indeed these are leaning more toward how I do things. I also believe that Salix and SlackEL are using modified versions of these scripts. Lachman, what are your constraints for requiring a stripped version? You have a USB stick with only a GB or less capacity? My ISO with full install of Slackware-current is 2.2 GB in size. With Plasma 5 instead of KDE 4, it expands to 2.5 GB. Aufs is an older implementation of filesystem unions than overlayfs, but it requires a patch to the kernel and recompilation. That is why I did not want to use it, because it requires manual interaction to create the ISO. Similarly, a computer which is running Slackware-current is already tainted, in the sense that it has your user account, packages you added, modifications you did to suit your needs. Converting that into a Live ISO is not my goal. Of course in order to create the Live ISO I first have to install all packages, but I do that to a chroot where I can apply all configurations through a script. No manual interaction is needed that way. Again, looking at your posts, I am pretty certain that my edition of Slackware-Live (a live demonstration of Slackware’s capabilities) will not be suited for you, because apparently you are using your Live OS in your daily work as the platform of your choice (instead of a regular install to hard disk). Apparently the founder of Porteus left, and his successor is going to abandon Slackware for Arch Linux and systemd as the base for Porteus. Yay.. not. I wonder where Porteus’ current users will migrate to. And what about update to libreoffice 5.0.3? Excellent idea Eric! I’m all for it. Raveriux – so many things to do… so little time. I do this in my own free time. so I pick my own priorities. My use case is not an exploratory one for the Linux community but a production one over a farm of computers. I boot over usb/pxe in a copy2ram sense. Once you add those requirements, size is the issue. The beauty of slax/porteus is the ability to make it small. In particular Tomas of slax was able to shrink kde like a pro. You are probably THE guy that knows exactly how to tackle that problem, BTW. My message to you is that it doesn’t take much to get from slackware-current to minimalist live. I think empowering a slacker to create his/her own live OS is easy to do and something missing in the Linux community. There are some secondary goals with this project, too. Removing documentation and man pages will get the size down even further, and excluding wallpapers and Asian fonts will shrink the ISO with many tens of MB again. This is EXELLENT and I think “the most wanted” site of A Slackware. Today it’s over 2 years old, outdated. Beginning to think of another distro with more frequent updates and also live version. And now a double surprice – Your excellent idea & “almost beta” from Pat! 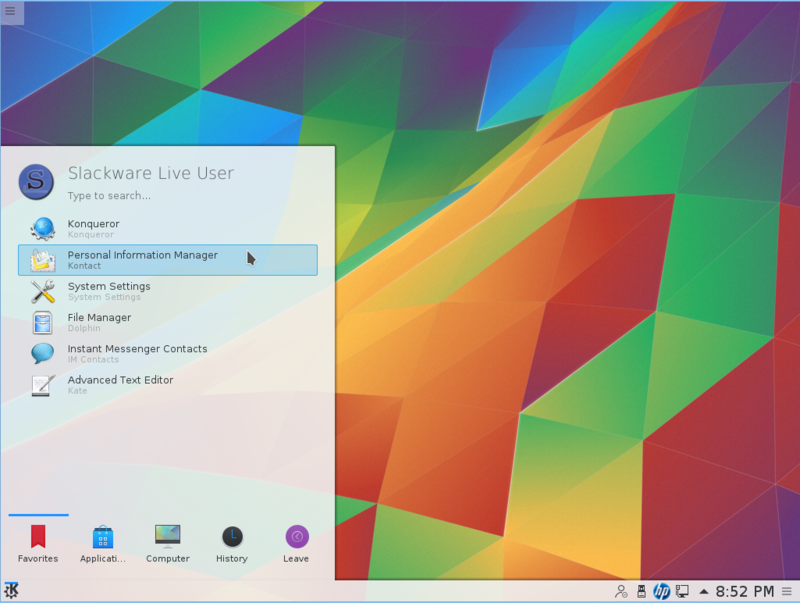 A long time I was looking for a live Slackware, but none was adequate for me – too customized. But pure Slackware live is a whole different story. How coud you be in doubt about acceptance of that excellent idea of you? Best wishes from my site! I think this is great!, this is the missing part of Slackware, with this as a tool, we can share more of slackware at ours installfest of FLISOL (festival latinoamericano de instalación de software libre / Latin American free software install fest) Every time when I tell what distro I use, the remaining question is “and do you have an live cd/pen of it to try it at home?” and always the answer was no, I don’t have one. So now we can show them about Slackware, I love this. First I would recommend Project L.
Secondly, a live demo of slackware-current never struct my mind but once I did try to create live iso using syslinux. It was not hard but I since it was the first time for me to use syslinux, in 2007 and 2008 I tried to study the booting process of slackware installer and emovix both which use syslinux. In fact emovix was a great inspiration at that time. I’m looking forward to the SlackLive syslinux configuration. I’d just like to add that Tomas hasn’t left Porteus. He is still around and maintaining the Porteus Kiosk version. Also I have not made the decision to move Porteus to an Arch base as yet. I am watching slackwares movements closely. Good to hear that, brokenman. Just saw this and think it is worth while, very much so! Thanks Eric, I use your repos all the time, also periodically test current install DVDs made with your other script. A Live-CD would be great for demo’ing (and testing) stock Slackware I think. Cheers. Will be posible modify your build of the Live ISO in order to mix it with your Ktown packages? So we can preview the advances on KDE that you make available on ktown or will you need help to make this possible? p431i7o, if you look at the screenshots you will notice that I already have a Slackware Live Edition featuring Plasma 5 instead of KDE 4. Currently my script “make_slackware_live.sh” has a few main targets: XFCE (700 MB ISO with stripped Slackware), KDE4BASE (1000 MB ISO with basic KDE4 desktop), SLACKWARE (2.2 GB complete Slackware-current) and PLASMA5 (2.5 GB Slackware-current with Plasma5). But you can customize these main targets by adding your own package lists, for instance local mirrors of 3rd party repositories which is how I added Plasma5 and slackpkg+. Or you provide your own squashfs modules to be joined into the overlay on boot. As an example the ISO contains a squashfs module of the latest Nvidia graphics driver plus the blacklist-nouveau package. By just adding “nvidia” to the boot command, this module will be used and your desktop has instant accelerated graphics. I do not own any Ati cards so Nvidia was all I wanted to add (because I am able to test that). Muito obrigado pelo seu trabalho. Temos certeza de que será um grande passo para o Slackware, mantendo a filosofia que tanto amamos. Thank you for your work. We are sure it will be a big step for Slackware, maintaining the philosophy that we love so much. if all the comments aren’t enough, I’ll throw in my vote for a resounding yes! always wanted a live version of Slackware! Out of curiosity, I decided to see how the udev -> eudev in last nights slackware-current update affected Linux Live scripts.. It boots, with a few errors, works, and doesn’t shut down properly.. Discussion is always welcomed here 🙂 The bootup errors should be ironed out soon, I already tested a patched udisks package and I believe a patched eudev will be added next. No idea why this would prevent a proper shutdown though. I am testing my live ISOs here and shutdown went OK. Truly remarkable Eric as always. My question about the installer is, will it be a netinstall to grab the full Slackware package set to keep the disk size minimal, or if the full package set is included, could it all be ran through ncurses and dialog based scripts? Redundant? Dude! No it isn’t. I don’t use live distros, I have no use for them. However, that having been said, that is because there is no Slackware Live. And to be base it on -current? That’s the best choice, it’s basically the only Slackware version I support when deploying managed services for my client base (So tired of CentOS upgrades… blechh…) – and that’s why my gotos are rolling distros that are designed to fit that model. Among those, there’s Debian Testing, Gentoo, Arch, and Slackware -current (Sorcerer has gone bye bye and was always an exercise in my sort of gaming, if you will, not a stable production environment). A “Slackware Live” would indeed eliminate those boneheads who offer reviews without taking time to become familiar with any of the distros they review – Making fun of our fricken’ installer, those notions that Slackware is somehow ‘out of date’, etc., and I am always beleaguered by that! To be certain, Slackware is more often than not the *first* to make moves, being the first distro to deprecate the Evil EllisonCo’s MySQL in favor of MariaDB before any of the other distros, and that’s just one example. Also, we’re looking forward to basing our new stable 14.2 on the 4.4 LTS kernel. And default file systems? What do you mean by default pale face? lolz. Not to cast aspersions anywhere, but When I read that SuSE’s default file system is now Btrfs, I don’t have to remind myself that there is no default file system in Slackware – it’s whichever one you choose! And the installer has to make that choice for themselves (beautiful!). A Slackware Live will open up a myriad of exposition related doors for us (and Patrick, who could use the much deserved publicity and all that brings with it in helping to ensure that he is secure enough to continue to make Slackware his only job). 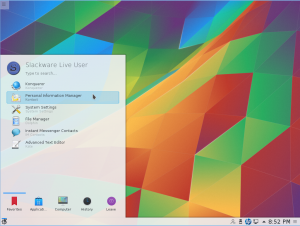 So will I start using live distros if there’s a Slackware Live? Nope. Prolly not – wait… Yes. Yes I will, because it will be, for me, analogous to a PowerPoint presentation for prospective adopters that I showcase it to. And on that note Eric, let me say that the attention to the XDM and SDDM graphics is oh so important for those gamebois out there who are hungry to post youtube videos by searching for distros to review. Okay, I’ll admit. Having a Slackware Live (Along side of my old Knoppix on a 1GB Swiss Army knife USB stick) on a thumb drive hanging off of my keychain will be convenient here and there…. for sure. Kudos Eric, thanks, thanks again, and I can honestly say that I’m more than a little excited about “Project X”. In the meantime we are two and a half months past this blog post and there were a couple of “beta” releases – scripts as well as ISO images – for you to try. Load the latest ISO and tell me what you think of it. I’ve long given up hope for DistroWatch. It’s largely irrelevant to Slackware users (or is it the other way round). I do not expect them to write anything about my Slackware Live Edition. 1- Anyone can submit a distro review, so if any of you guys and gals want to give it a try there’s no need to wait for an “official” dw review. 2- Jesse Smith (the man who usually does the reviews) is actually very fond of the BSDs, maybe if we suggest him to give Slackware 14.2 or Live a try he’ll review it. And sorry not only for commenting in such an old blogpost, but also going OT! If I wanted that people only commented on my most recent posts I would have disabled the comments section of older posts, but I do not see any value in that. Feel free to comment to my older posts if you think that is useful.